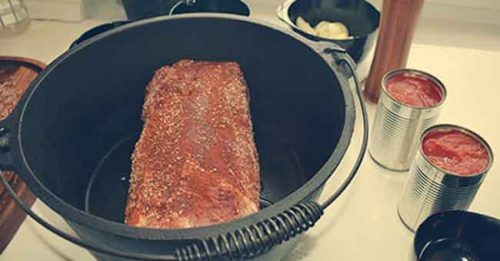 Cooking pulled pork in a dutch oven is the perfect way to slow things down, and spend some quality time together as a family. With this recipe there you will have everyone happy and full, and you wont need to spend the entire day in the kitchen. That makes this recipe the perfect campfire meal. 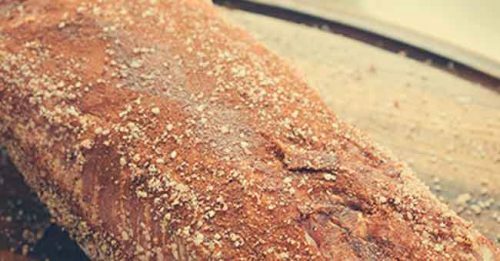 Cooking pulled pork in your dutch oven over a campfire, is simple – and everyone will love this flaky meat I’m sure. I’m a huge fan of giant reward for little effort and that is exactly what this pulled pork recipe is. Dry the pork meat off. 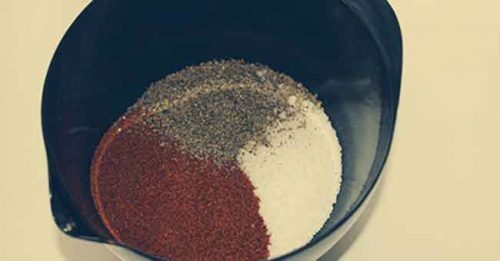 – Mix all the dry ingredient. Rub the dry spices on the meat. Roughly peal and chop the onions and garlic-place the meat in your dutch oven. Add the onions and garlic. Add the tinned tomatoes, barbecue sauce of your choice and stock. Add water until the meat is covered, and keep coming back to it over the next 5 hours to make sure it doesn’t go dry. Once the meat falls apart when you pull on it with a fork, its done. This will take about 6 hours. Pulled pork is an american classic. Traditionally the pork meat is smoked over wood until tender. Pulled pork was originally created by the Spanish settlers, that was inspired by the way the natives cooked their meat over fire. Pulled pork is a slow process and the fire is what gives the meat its smokey flavor. 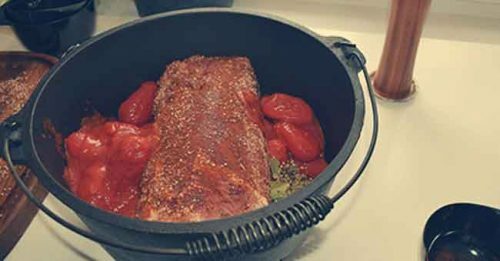 You can also cook pulled pork in a slow-cooker. 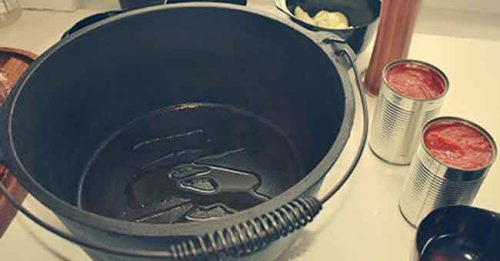 This recipe also works well in a clay cooker for the oven, just set the oven to 260F or 125C and follow the instructions. You need to put all of the ingredients together, and you need to do that ahead of time. 6 hours before you want to eat. 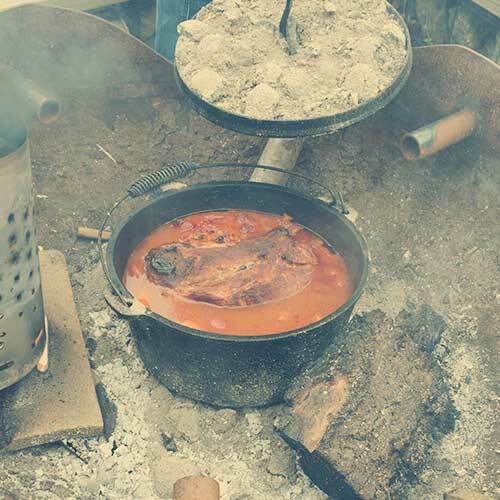 This recipe is cooked over fire, so you will need access to a fire pit. You will also need a dutch oven. We have cooked this several times, both using firewood and charcoals. 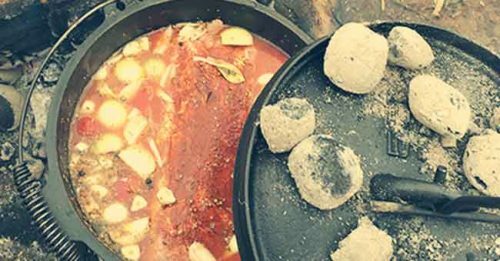 Charcoals are easier to control, because you can have a set amount around the dutch oven at all times. Firewood can burn with different degrees and are harder to control, but it can be done. 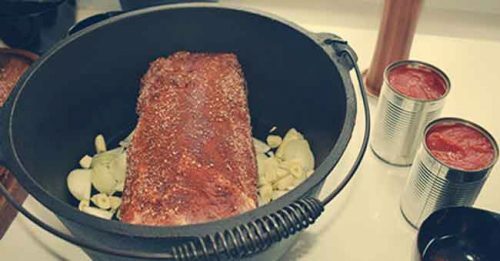 TIP: When we cook this pulled pork while camping, I mix all of the dry ingredients from home. If I’m cooking within the first two day, I even chop the garlic and the onion and bring it in a small bag or container. That way its super easy to poor everything into the dutch oven once we are at the camp site. Other than that, its simple, and all you need to do is spend a day by the fire, and check in on your pulled pork here and there. You want to make sure that it is covered in water at all times. How long does it take to make the best pulled pork? 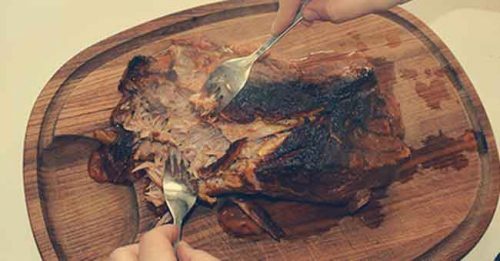 Pulled pork need a long time at low temperatures to be tender enough for your to pull it apart. My father usually say that its tender enough that you can thew it with your eyebrows. That is not quite true but this recipe does make the meat come apart nice and easy when you pull on it with a fork. It takes about 6 hours over the fire, or in the oven for the meat to be tender. If it doesn’t come apart, try giving it another 30 minutes. TIP: If you have a lot of meat and there will be something left for another day, don’t pull it apart today. If you wait and keep it as a whole piece of meat, it will be easier to reheat it and for it to keep its moisture. 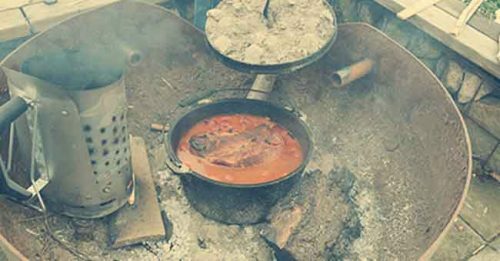 Pulled pork cooked over your campfire, in a dutch oven. 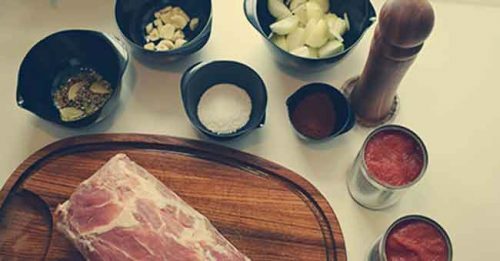 Its slow food at its best, and you do not need to spend time cooking, just spending time watching as it turns into the most tender pulled pork you have ever had. Light a fire, or start about 20 charcoal briquettes. TIP: The charcoal will make it easier to control the temperature of the cooking. You need about 12 charcoals under and about 8 on top, and you should aim for a temperature around 260F, or 125C. Mix all the dry ingredient. Roughly peal and chop the onions and garlic. place the meat in your dutch oven. TIP: if there is more fat on one side compared to the other then place that facing down. This will help your meet to not get to burned on the bottom of the dutch oven. 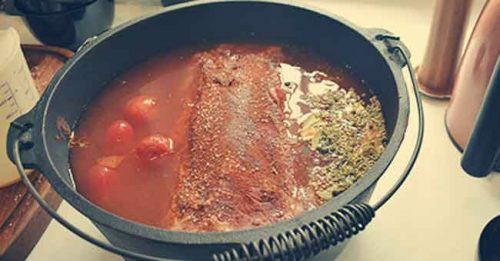 Add the tinned tomatoes, barbecue sauce of your choice and stock. If you have your own tomatoes from the garden they will work just fine, just roughly chop them up an add them to the pot. You will need 4-6 tomatoes to replace a tin, depending on the size of your tomatoes. Add water until the meat is covered, and keep coming back to it over the next 5 hours to make sure it doesn't go dry. This was the perfect way to spend a day by the fire, and an evening together with good friends talking about big and small. Let me know what you think, in the comments below or send me an email. I would love to hear from you.